Finesse anglers will enjoy the solid feel and fluid handling of the compact low-profile baitcaster, courtesy of 10 premium stainless steel Anti-Rust Bearings, flex-free aluminum frame and side-plates, ultralight A7075 aluminum Lo-Mass Spool and high Efficiency Gearing VBS cast control uses balanced centrifugal brakes (spare blocks and weights included) for prime accuracy in all conditions. Smooth Dartanium drag; Super Free pinion gear friction elimination; tapered titanium levelwind insert for extra distance; Super Stopper anti-reverse with Assist Stopper backup; cold-forged handle with ergonomic Septon paddle grips. "Yep I'm a lefty. Over the past 4 years i have slowly been buying the Calais reels to replace my others. They are very costly but think they are worth it. Now have 6 of these. " "Smooth, solid, superb, and slick looking as well they should for what they cost. 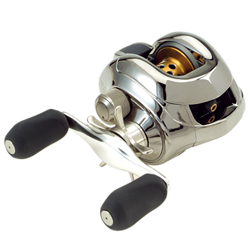 I have Calcutta TE-GT's, Daiwa Steez reels and the Calais is best overall reel I've used. They are comfortable and an absolute pleasure to use." ""I agree with all of the other reviews it is the best reel I have ever had in my hands. It's low profile and the way the real fit in your hands is amazing. They are very very smooth and cast great!" "I got a 200a and joined it with a johnny morris elite series trigger rod 7'0 fast action and it is the best out there. you can cast a mile far without even trying you should buy it"